Our 1934 Goudey #53 George Watkins error card just arrived back from SGC and is on our site and available for purchase. This card has been on quite the journey, as we have had to send it to two different grading companies in order to get the white background variation acknowledge. SGC finally did acknowledged the white background variation and gave it a grade of SGC 4 VG/EX. 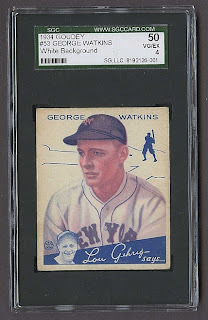 We have received many calls and emails about this card because it appears to be a one-of-a-kind item, so we are glad that we can finally put it up on our site. You can click here to read our blog article from several months ago about the card.